Proficiencies: ●All simple & martial weapons. ●The mount is always considered "combat trained"
●Gets +4 circumstance bonus on all Handle Animal checks made regarding his mount. even if he doesn’t have any ranks in the Handle Animal skill. ●Ranged attacks on target gets (1 + [lvl 19 +item 4]×1/4) = +6 morale bonus. ●Melee attacks on target adds (cavalier lvl 19 +item 4) = +23 to damage. they get –2 penalty to AC against attacks made by anyone other than the challenger. ●Gets no penalty to AC after making a charge attack while mounted. ●If mounted, double threat range of weapons wielded during a charge. This doesn't stack with other effects that increase threat range of a weapon. ●If the charge attack succeeds, can make 1 free bull rush, disarm, sunder, or trip maneuver, without provoking an AoO. ●Both bonuses increase by +1 per (5 cavalier levels) > (5th lvl) = +4 & +3 bonus. Greater Banner (Ex): Adds the following benefits to the basic ability. ●All allies within 60 ft get +2 morale bonus on saves against charm & compulsion spells & effects. any 1 spell or effect that's targeting them, against the original DC. ►Spells & effects that don't allow a save aren't affected by this ability. ►An ally can't benefit from this ability more than once per day. ●Can grant this feat to all allies in 30 ft (60 ft, due to item) who can see & hear you. ●Can do this (1 +1 per 5 cavalier lvls +1 from item) = 5 times per day. ●This takes a Standard action, and it lasts (3 +1/2 cavalier lvl +2 from item) = 14 rounds. ●Get 1 more (Teamwork)-type bonus feat that you meet the prerequisites for. ●Using ''tactician'' ability now grants allies 2 of your Teamwork feats. gets bonus = +1/2 cavalier lvl (min +1) = +9 bonus. ●Receives "Catch Off-Guard" as a bonus feat. any attacks he makes during that round with an improvised weapon. This ability requires a Swift action, and can be used max once per combat. 8.Terrain Training: Urban & Plains & ??? ●Can boost other's Initiative, Knowledge (geography), Perception & Survival. ●Bonus = (Cha modifier) = +3 Competence bonus, but only applies while in the chosen terrain. ●This bonus is granted to ALL allies within 60 feet who can hear him & his instructions. ●This takes a Standard action, and it lasts (1/2 cavalier lvls) = 9 rounds. ●For every 4 levels after 8th level, gets to add 1 new Terrain type to use with this ability. ●The cavalier & his mount can ignore "difficult terrain" for the purpose of making a Charge attack. ●In addition, if the charge attack is successful & both the cavalier & his opponent are occupying squares with "difficult terrain", the cavalier gains a +2 competence bonus when using his "mighty charge" ability to make a bull rush, disarm, sunder, or trip Maneuver. 1B.Catch Off-Guard: ●You don't suffer any penalties for using improvised melee weapons. 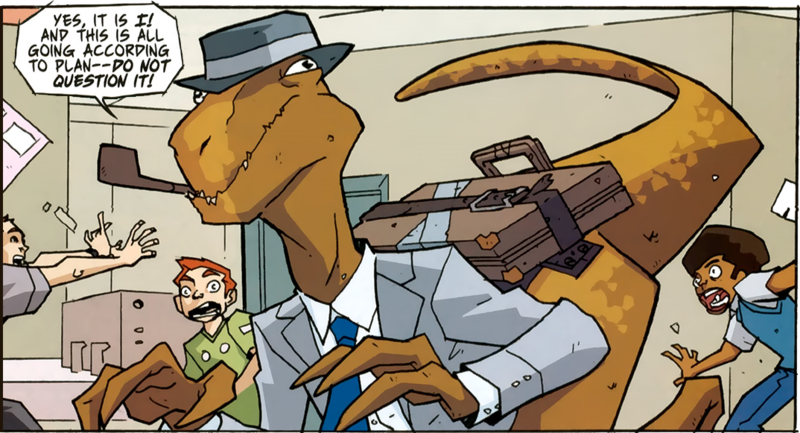 1.Dinosaur Bond: Has 1 dinosaur character is bonded with. ●Get +4 to Ride checks with it. ●If mounted on bonded dino, both self & dino get +1 to AC & Reflex saves. 3.Mounted Combat: ●If mount is hit in combat, can try to prevent that attack. ●Make a Ride check as an Immediate action, at difficulty = (the attack roll). ●If this succeeds, it negates the attack entirely. ●Can do this once per round. 5.Ride-by Attack: ●Requires that you're mounted and use the "Charge" action. ●May move & attack (as if with a standard charge), and then move again (continuing the straight line of the charge). ●Your total move for the round can’t exceed (2x mounted speed). ●You & your mount don't provoke an AoO from the target you attack. 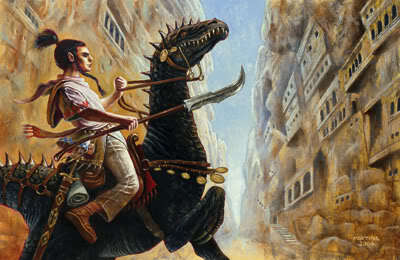 15.Talenta Skirmisher: If your bonded dinosaur-Mount moves its speed or less, you can still take a Full-attack action. Normal: If your mount moves more than 5 feet, you can only take an attack action. –2 instead of –4 if your mount is taking a double move, and –4 instead of –8 if your mount is running. Note: Mount has a feat which reduces these penalties even further, by –1 and –2. Final result: Get –1 during a double move & –2 while mount is running. 6B.Talenta Warrior (Combat): ●Get +1 damage with Talenta-weapons while mounted. ●"Talenta"-weapons all count as same weapon for weapon-specific feats (f.ex. "weapon focus"). ●If uses Action Point on attack with "Talenta"-weapon, the action point die also adds to damage. 9.Improved Critical (talenta tangat): Double the crit threat range of the chosen weapon. ●Can draw a weapon as a Free action instead of as a Move action. ●Can draw a hidden weapon as a Move action. ●May throw weapons at his full normal rate of attacks (much like a character with a bow). 7.Hobbit Hunter Style: If you do a Full-attack action, and as your first attack you throw a talenta boomerang, you can attempt to make it a "ricochet attack" by taking a -2 penalty on the attack (chosen before rolling). This also inflicts -2 on all your later attacks this round. ●You also get a 2nd attack (at full attack bonus) against a new target within 1 range increment of the first target. ●You determine cover for this attack from the first target’s space instead of your space. ●You can make only 1 additional attack per round with this feat. 13.Hobbit Hunter Headshot: If you successfully damaged the target with a thrown talenta boomerang in the previous round, then a successful thrown attack on them with a talenta boomerang not only inflicts damage but also forces them to make a Fortitude save (DC +1/2 your lvl +your Dex modifier) = (DC +14) to not be "dazed" for 1 round (until just before your next action). but then this can't affect any other targets for the rest of the round. you can make 1 single ranged thrown weapon attack with a talenta boomerang, at your full attack bonus. ●If you hit, you deal damage normally and get to make 1 additional attack on a new target. ●Each time you hit you get to make another new attack. ●You can make a max number of these attacks = (1 +1 per 4 BaB) = 5 attacks. ●The next target must be within 1 range increment of the previous target. ●You can't attack an individual target more than once during this attack action. ●You determine cover for each attack from the most recently hit foe’s space instead of from your space. & you must choose whether or not you attempt to daze a victim before you roll the attack. This is still limited to those you harmed with a thrown talenta boomerang in the previous round. 18B.Deadly Aim (combat): ●Can choose to take a –1 penalty on all ranged attack rolls to get a +2 bonus on all ranged damage rolls. ●When BaB reaches +4, and every +4 BaB thereafter, the penalty increases by –1 & the damage bonus increases by +2. ●You must choose to use this feat before making an attack roll, and its effects last until your next turn. ●Damage bonus doesn't apply to touch attacks or effects that don't deal HP damage. Result: Can take –5 on ranged attacks to get +10 to damage. until the beginning of the feinter's next turn. you all take the highest roll & add all your Stealth modifiers. you’re both considered to be flanking that enemy, regardless of your actual positioning. ●You & the ally must be of different size categories. ●The target must be the same size category as either you or the ally. Sharding: (magic weapon ability). The wielder can make a special ranged attack with the weapon, by going through the motion of throwing the weapon without actually releasing it. This makes the weapon split off a duplicate of itself that flies at the intended target as if the original weapon had actually been thrown by the wielder. The duplicate vanishes when the wielder's turn is over. Headband of Alluring Charisma: +4 cha while worn. Belt of Nimble Strength: +6 str & +2 Dex while worn. Ring of Protection: (slot: ring #1) Gives +5 deflection AC. Poncho of Resistance: (slot: shoulders) Gives +5 resistance bonus to all Saves. ●its effect lasts +2 rounds longer than normal. ●Depicts the insignia or heraldic symbol of its wielder. ●Can be used to fulfill the requirements of the "banner" ability. ●Carrier treats their class as 4 lvls higher when determining the effect of their "challenge" ability. only the value of the bonuses it grants when they activate it. Dino-Master's Saddle: This ornate military saddle is tooled with an elaborate saurian motif. ●Gives the mount a +5 competence bonus on Acrobatics checks. ●Gives the mount's rider a +5 competence bonus on Ride checks. ●The mount gains the benefits of any teamwork feats the rider has. ●Gives +2 circumstance bonus to Ride checks related to staying in the saddle. ●If rider is knocked unconscious, he has a 75% chance to stay in the saddle. Saddlebags of Holding: Same effect as "Handy Haversack", just different shape on the outside. Handy Haversack: Backpack, with 2 side pouches that each appears large enough to hold about a quart of material. ●In fact, each of the 3 sections is like a "bag of holding": Bigger on the inside. ●2 side pouches can hold as much as 2 cubic feet in volume or 20 pounds in weight. ●Large central portion of the pack can contain up to 8 cubic ft or 80 pounds of material. ●Even when so filled, the haversack always weighs only 5 pounds. ●When the user reaches into it for a specific item, that item is always on top. ●Thus, no digging aound & fumbling is ever necessary to find what a haversack contains. ●Retrieving any specific item from a haversack is a Move action. ●Therefore, it doesn't provoke the AoO's that retrieving a stored item usually does. Each side of a saddlebag can typically carry 20 pounds of items that can fit in the bags. Sandals of Lightning Leaping: (slot: feet) Usable once per day, on command. ●Lets wearer transform into a bolt of lightning & move up to 50 feet in a straight line. ●Re-materializes at the far end of the lightning bolt's path. ●Movement while in lightning form doesn't provoke Attacks of Opportunity. ●Objects along the way take damage as per the "lightning bolt" spell. and is then "staggered" for 1 round. Mask of Merging Souls: (slot: head) This traditional mask is made out of the decorated skull of the same sort of dinosaur that the wearer has bonded with. It can only be used by a hobbit who has chosen a dinosaur as their animal companion, familiar or cavalier mount, and which they have performed the traditional bonding ceremony with (taken the "Dinosaur Bond" feat for). It can be activated once per day, which gives the wearer the effects of the "share shape" spell, while their bonded dinosaur gets the effects of the "anthropomorphic animal" spell, which first exchanges their worn gear with the other's. Lasts 7 hours. Bite: Damage: 1d4+10. Crit: x2. Languages: Can speak in the Hobbit language, but can only understand (& read) common, can't speak it. Low-Light Vision (Ex): Can see twice as far as humans in conditions of dim light. Evasion (Ex): If the mount is subjected to an attack that normally allows a Reflex save for 1/2 damage, it takes no damage if it makes a successful saving throw. Improved Evasion (Ex): When subjected to an attack that allows a Reflex saving throw for 1/2 damage, the mount takes no damage if it makes a successful saving throw, and only 1/2 damage even if the saving throw fails. Devotion (Ex): Gets a +4 morale bonus on Will saves against enchantment spells & effects. Multiattack (Ex): Gains a second attack with one of its natural weapons, albeit at a –5 penalty. Scent (Ex): Allows a creature to detect approaching enemies, sniff out hidden foes, and track by sense of smell. Creatures with the scent ability can identify familiar odors just as humans do familiar sights. Range: Can detect others within 30 ft by sense of smell. Upwind: 60 feet. Downwind: 15 feet. Strong scents: (f.ex. smoke or rotting garbage) is detected at 2× ranges noted above. Overpowering scents: (f.ex. skunk musk or troglodyte stench) is detected at 3× normal range. ●When it detects a scent, the source's exact location isn't revealed, only its presence within range. ●The creature can take a Move action to note the direction of the scent. ●When the creature is within 5 feet of the source, it pinpoints the source's location. Creature can follow tracks by smell, making a Wisdom or Survival check to find or follow a track. ●Following a fresh trail typically has DC 10 (no matter what kind of surface holds the scent). ●Creatures tracking by scent ignore the effects of surface conditions & poor visibility. ●For each hour that the trail is cold, the DC increases by +2. Other than this, the ability follows the tracking rules for the Survival skill. Hat of Disguise: This apparently normal hat allows its wearer to alter her appearance as with a "disguise self" spell. As part of the disguise, the hat can be changed to appear as a comb, ribbon, headband, cap, coif, hood, helmet, or other headwear. Disguise Self: You make yourself—including clothing, armor, weapons, and equipment—look different. You can seem 1 foot shorter or taller, thin, fat, or in between. You cannot change your creature type (although you can appear as another subtype). Otherwise, the extent of the apparent change is up to you. You could add or obscure a minor feature or look like an entirely different person or gender. Talenta Collar: If worn by a dinosaur who's the bonded animal companion or mount of a hobbit, this item enables the wearer to speak the "halfling" language, even if it isn't normally capable of speech because of its low Intelligence score, lack of known languages, or not having a throat physically capable of humanoid verbalization. 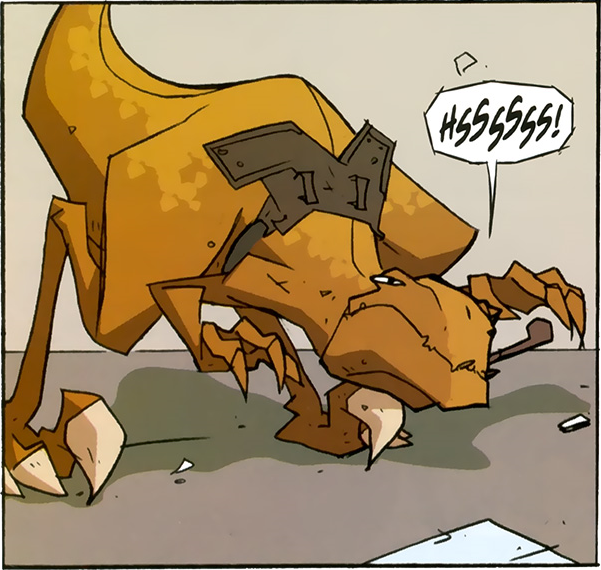 The item doesn't grant the dinosaur a bonus to Intelligence, and the animal's general behavior remains largely the same while its master wears a Talenta Collar, though it can communicate its desires and rudimentary knowledge as though being spoken to via "speak with animals". Impressive Headband of the Sick Burn: A circle of decorative feathers meant to be as dominant and overwhelmingly superior as possible, crowned with a gem in the front, hanging suspended on the wearer's forhead. Once per day, the character can unleash an insulting put-down so vicious and belittling that enemies who hear it are physically burned by it. As a Standard action the character can make one Intimidate check to "demoralize" every single opponent within 30 feet (similar to demoralizing a single target, as per corebook p99). All targets the character manages to demoralize in this way take 1d10 fire damage and must succeed on a Reflex save or else catch on fire (DC=13 +1 per 5 extra by which Intimidate chech succeeded by). Spell Resistance can negate the fire damage, but not the demoralizing effect. LAZER Goggles: Allows wearer to shoot laser-beams from the eyes, once/round, as a ranged touch attack that inflicts 1d4+1 fire dmg. ●+1 insight bonus to AC. ●+10 competence bonus on Bluff checks to feint in combat. ►Readying the cape in combat is a Move action. ►If wielder has BaB ≥ +1, they can ready it as a Free action as part of movement. Ankle-wraps of Speed: ●Increases the animal's base land speed by +30 feet. ●This counts as an enhancement bonus. ●As with other effects that increase speed, jumping distances increase proportionally. ●Both wrappings must be worn by the same animal for the magic to be effective. Cloak of Elvenkind: Gives +5 competence bonus on Stealth checks. ●Fortitude saves made to resist damage from suffocation. Also: You may sleep in light or medium armor without becoming ''fatigued''. Diehard: When your HP total is below 0, but you aren't dead, you automatically stabilize. You don't need to make a Constitution check each round to avoid losing additional HP. You may choose to act as if you were ''disabled'', rather than ''dying''. You must make this decision as soon as you are reduced to negative HP (even if it isn’t your turn). If you don't choose to act as if you were ''disabled'', you immediately fall unconscious. f.ex. casting a quickened spell) you take 1 damage after completing the act. If your negative HP are equal to or greater than your Constitution score, you immediately die. (to a max of DR 5 / –), which lasts until the start of your next turn. ●This DR stacks with any you gain from class features (f.ex. barbarian's DR), but not with DR from any other source. ●If you are denied your Dexterity bonus to AC, you are also denied this DR.
and you get a +6 dodge bonus to AC when taking the "total defense" action, instead of the usual +4. Ostentatious Display: ●As long as you are wearing a valuable non-magical item in a magic item slot, you gain a +2 bonus on skill checks with a corresponding skill. ●Bonuses from wearing items that affect the same skill don't stack. ●Each item must be worth ≥ 5% of your wealth by lvl (currently 5'400 gp). ●Your AC penalty when charging is halved. ●Penalties on ranged attacks made by your rider are reduced by 1 when you double move & by 2 when you run (min. penalty of 0). ●Your rider gains a +4 bonus on concentration checks caused by your motion. ●His favorite pet hobbit . ●Someone taking away his pet hobbit .